Tapenade is a staple appetizer at many a dinner party. And more often that not, this tapenade is store bought. Sad. Since it is unbelievably easy to make. I'm sure if you were to look in your pantry, you will find that you already have the ingredients to make a perfectly decent, perfectly gourmet-store-worthy hor d'oeuvre. But don't just stop there. Use as a sandwich spread, in soups, tossed in pasta. The possibilities are endless. I have used kalamata olives here because they are sweeter than most other olives. 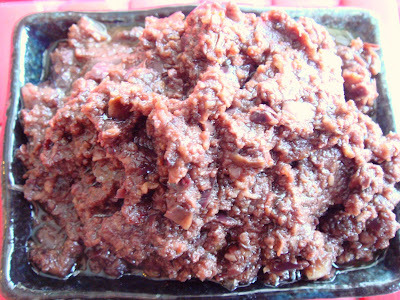 Paired with dates, it produces a relatively fruity tapenade. However, you can use any olive on hand, paired with another dried fruit such as raisins or figs. Or take a savory approach with artichoke hearts, roasted red peppers, or even cocktail onions. You simply can't go wrong here. Soak dates in one cup of hot water for fifteen minutes. Drain. Add to food processor with remaining ingredients. Puree and pour into serving dish. Serve with dry toast or multigrain crackers. Sounds great! I love everything that has garlic. This sounds like a great raki appetizer. Have to try. It must tastes divine… with garlic and the optional sherry should give a fruity touch! Yes this will be a great raki appetizer because it has traditional mediterranean ingredients. Thanks for your comment my dear. You are right! The sherry was purposely added for additional fruitiness. oooh fab! And like the new profile pic! Thanks Gail! I was a bit hesitant about getting bangs but so far it's growing on me.